The Hawaiian Islands attract some of the most skillful divers in the world. With breathtaking underwater seascapes, divers will find themselves in reefs full of brightly colored fishes. Diving in Hawaii offers a unique experience. As evidence of this, you will not see 20% of reef fish in Hawaii anywhere else in the world. Here’s another interesting point about reef fish in Hawaii. Most people call fish in Hawaii by their Hawaiian, and in some cases, Japanese, names. Depending on the kind of fish, some may also have different names to describe a young adolescent fish. While others may have a different one when it reaches full maturation. For example, local fishermen call a young goat fish o’ama. But when it is mature, they call it weke. In several instances, many people outside of Hawaii now use the Hawaiian name for some fish. 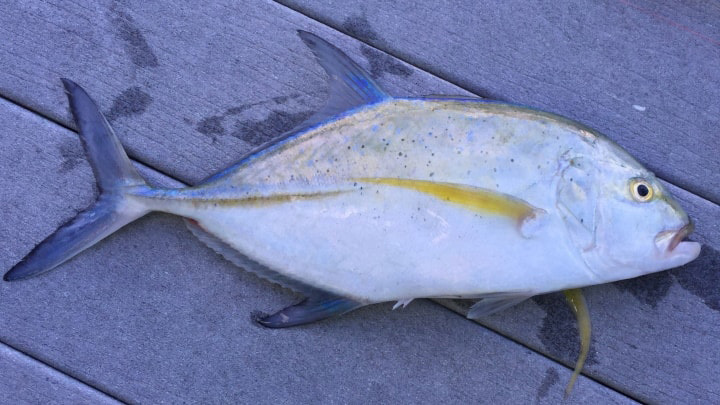 For example, many use the name mahimahi instead of dolphin fish and ahi for yellowfin and bigeye tunas. The colorful looking humuhumunukunukuapua’a or Hawaiian triggerfish is the Aloha State’s official fish. Some of the triggerfish on Hawaii’s reefs are: humuhumu le le or black triggerfish, humuhumu mimi or bridled triggerfish and humuhumu lei or lei triggerfish. In Hawaii, when a bigeye scad is young, locals call it a halalu, but when it’s mature, akule. Another popular type of scad in Hawaii is the opelu or mackerel scad. Both the akule and opelu are popular comfort food dishes among local Hawaii residents. Many typically eat them fried with soy sauce along with a bowl of rice. There are a wide variety of snappers that live on Hawaii’s corals reefs. They includes the prolific ta’ape or bluestripe snapper, uku or grey snapper, ehu or squirrelfish snapper. There are also the to’au or blacktail snapper, wahanui or forktail snapper and kalekale or Von Siebold’s snapper. Many of these fishes are good to eat and you can find them in many local fish markets. Without question, the most notable type of jacks or trevally in Hawaii is the ulua. But when uluas are typically less than 10 to 12 pounds, fishermen call them papio. These majestic and powerful predatory fish hunt prey on the reef. Among local fishermen, this is the most prized reef fish in Hawaii. Many also like them for their taste, particularly when they are not very large. Types of uluas include the white ulua or giant trevally, omilu or bluefin trevally and ulua pa’opa’o or yellow trevally. Another type of jack living off Hawaii’s reefs is the kahala or amberjack. The kahala is prone to carry the ciguatera toxin, which is poisonous. Lastly, there is the lai or leatherback. Fishermen often use its tough shiny skin in lure making. The Hawaiian coral reefs offer an abundant feeding ground for several shark species. Among them are blacktip reef shark, cookiecutter shark and sandbar shark. Other types also include the scalloped hammerhead, tiger shark and whitetip reef shark. The two most commonly found eels in Hawaii are the moray and conger eels. A moral eel is called puhi in Hawaiian. Typically, moray eels are not very aggressive by nature. But they can be dangerous when divers provoke them. On the other hand, conger eels have no real teeth to speak of. Local fishermen call them tohei or white eels and use their meat as bait. Hawaii has 25 of world’s 350 known species of nohu or scorpionfish around the world. Some nohu, like the nohu pinao or Hawaiian lionfish, is highly visible with its colorful and long flowing fins. But its spines are extremely toxic. On the other hand, the nohu omakaha or devil scorpionfish is a master of disguise, often mistaken for a rock. When the nohu omakaha stings someone with its spines, it will cause throbbing and sharp pain. So if you see nohus in the water, you should definitely stay away from them. The uhu or bullethead parrotfish might be the most colorful reef fish in Hawaii. Parrotfish are aptly named. This is because they have powerful teeth that look like a parrot’s beak. They use it to eat algae and polyps off of the reef. They are also popular to eat either steamed or baked. And you may see many restaurants in Hawaii serving uhu on their menu. Other type of uhus includes the palenose parrotfish and the uhu palukaluka or redlip parrotfish. The ala’ihi or Hawaiian squirrelfish is more commonly referred in Hawaii by its Japanese name, mempachi. As nocturnal feeders, one of the most notable features of the mempachi is its big eyes. They can absorb light from the moon and stars to help it see at night. The mempachi makes grunting sounds by grinding its teeth and stretching its gas bladder muscles to scare away predators. So some say it sounds like the chatter of squirrels. So if you hear squirrels’ grunts while diving, you are probably near mempachis trying to scare you away. To see these fishes in their natural habitat, explore one of the many coral reefs in Hawaii. So when you travel to the Aloha State, try free-diving, scuba diving, snuba diving or snorkeling in the waters off Hawaii’s shores.